A very easy to practically implement Yantra Remedy for stopping all the activities, actions and probable intentions of an enemy that are directed against you has been described in this post. 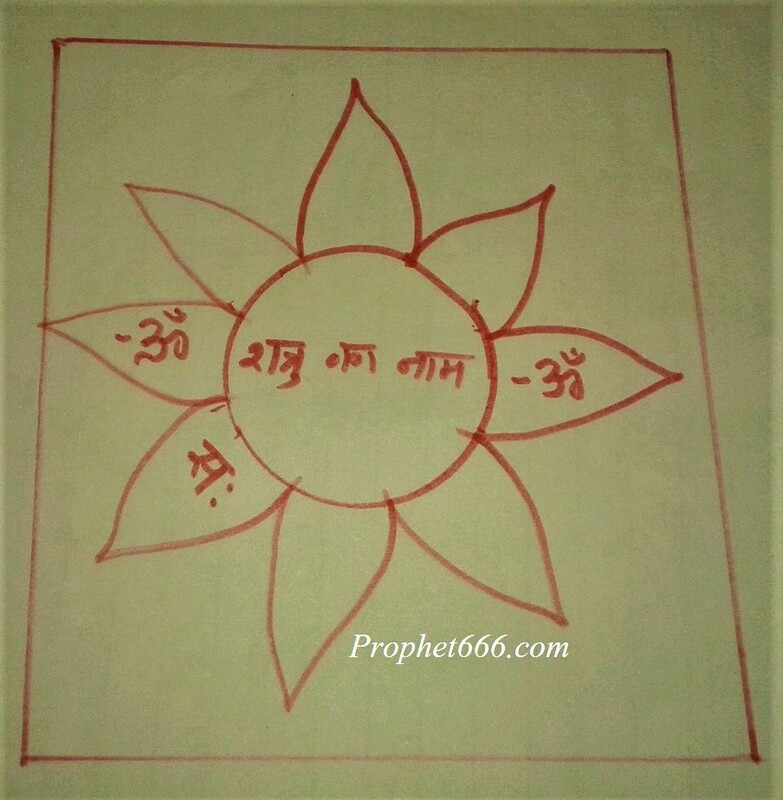 This is a Bina Mantra Ka Yantra, which is called as the Shatru Mukh Nashak Yantra in the Hindi language. Dushman Mukh Stambhan in the context of this post means to close down all the actions or probable intentions of that enemy, which are directed or going to be directed towards the practitioner in the future. The procedure on making and using this Shatru Nivaran Yantra Upay has been described below. 1] The Yantra can be prepared on any day on a Bhojpatra or white piece of paper as shown in the example image of the Yantra given below. 2] The practitioner has to use a few drops of his own blood as the ink and any pointed wooden or metal stick, including an iron or pin as the pen for drawing the Yantra. 3] The Shatru Nashak Yantra should then be place on a wooded board and worshiped by lighting Dhoop and Diya. 4] Then, the practitioner should take milk in a Katora or small metal utensil and immerse the Yantra in the milk and keep it in any place in his house for 21 days. Boiled or unboilded cow or buffoloe milk can be used in this Yantra Prayog. It does not matter if the milk get spoilt or evaporated after some time. 5] Then, after 21 days the utensil along with the Yantra and leftovers of the spoilt milk should be removed from the house and kept in any place outside the house or immersed in a river, lake or any other water body. Note- You can see many Yantras, Charms and Mantras for resolution of all kinds of enemy related problems in the sections on – Mantra Tantra for Enemies, Yantra and various other sections of this site. Can I write more than one enemy name in the yantra?